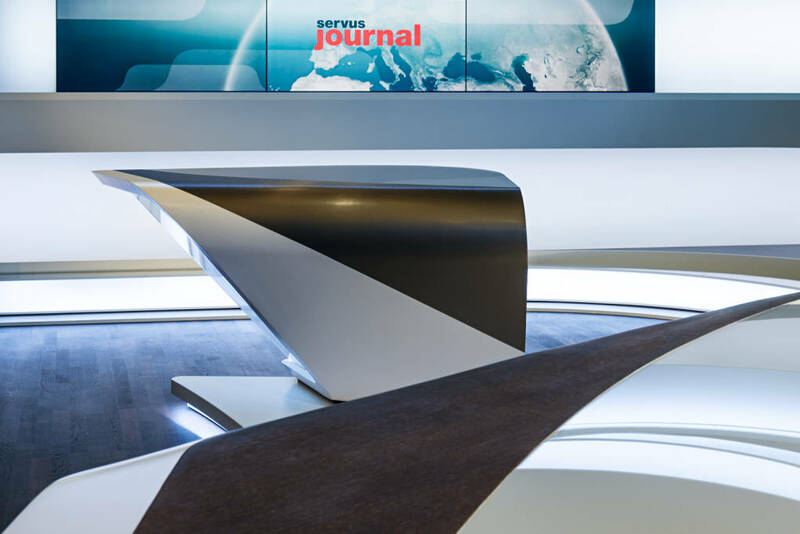 The re-design of the broadcast studio conceived and built by Veech x Veech for Red Bull’s 2009 channel launch of ServusTV targeted the creation of a new identity reflecting the duality of the news program format. 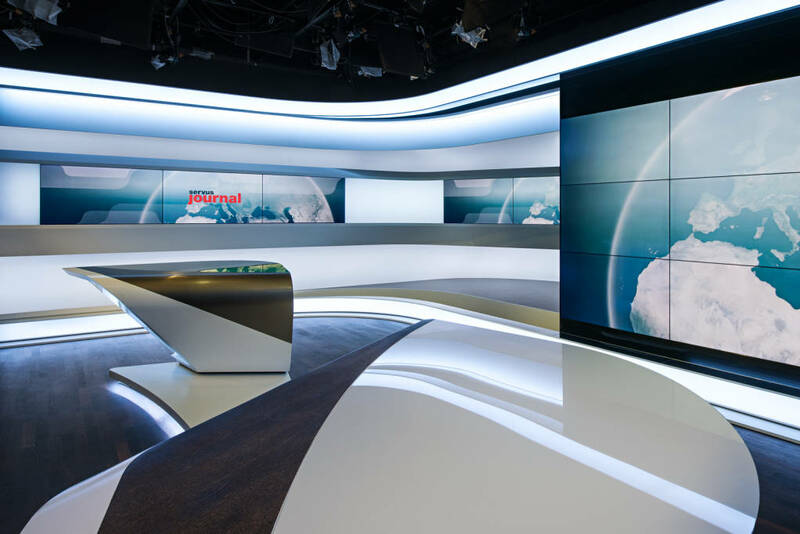 Veech x Veech transformed its previous design into a multifunctional, sophisticated 270-degree studio combining peerless aesthetics, functionality and technological advancement with the flexibility to incorporate and project the visual identities of two distinctive news formats. The new ServusTV studio went on the air at the end of April 2015. 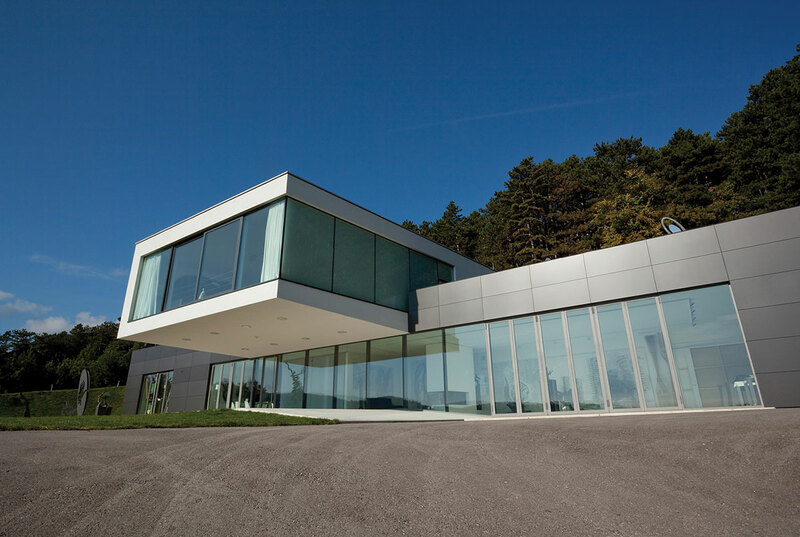 The successful cooperation began in 2007 when Veech x Veech was chosen to design the interiors of the two shell buildings for the newly established Red Bull Media House multi-platform media company located in Salzburg, Austria. 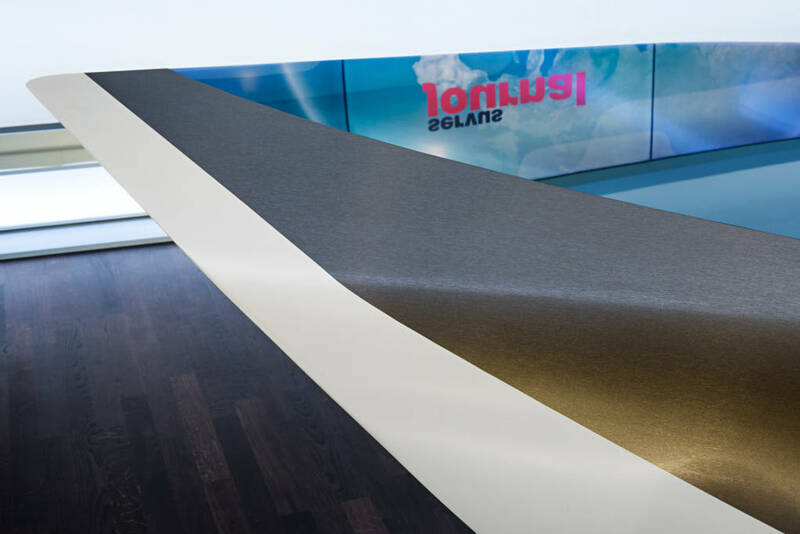 The design team delivered more than 2000sqm of workspace with custom-made furniture for this young, innovation-driven workforce, including open-plan offices, edit rooms, meeting rooms and a multifunctional foyer. Alongside the functional and technical requirements, the design goal was to translate the aerodynamic design world of Red Bull racing into a sleek and formal design language that embedded media technologies. The new ServusTV news studio incorporates two different broadcasts. 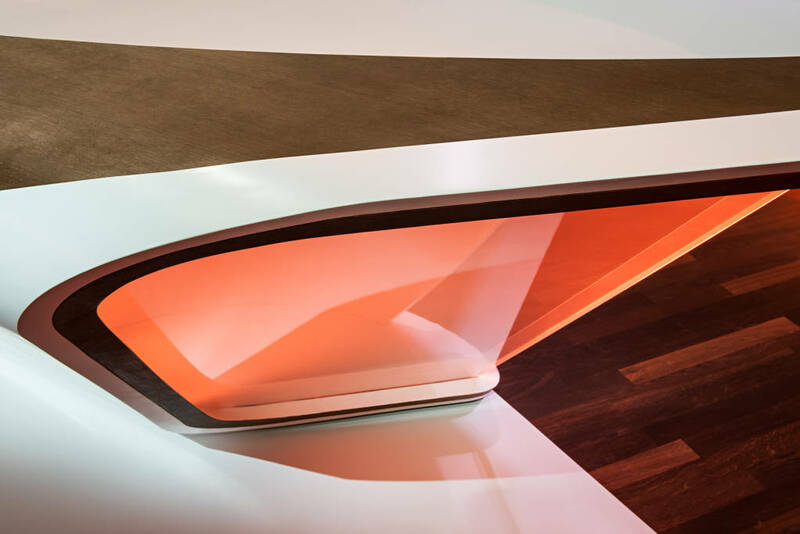 The differentiation between the two formats is achieved by means of the materials and surface structures of the presenter desks as well as custom-designed light choreographies. While cooler shades of blue emphasize the informative, factual nature of the news broadcast “Servus Journal”, warm orange and yellow shades underscore the entertainment interest of the TV magazine “Servus Krone”. 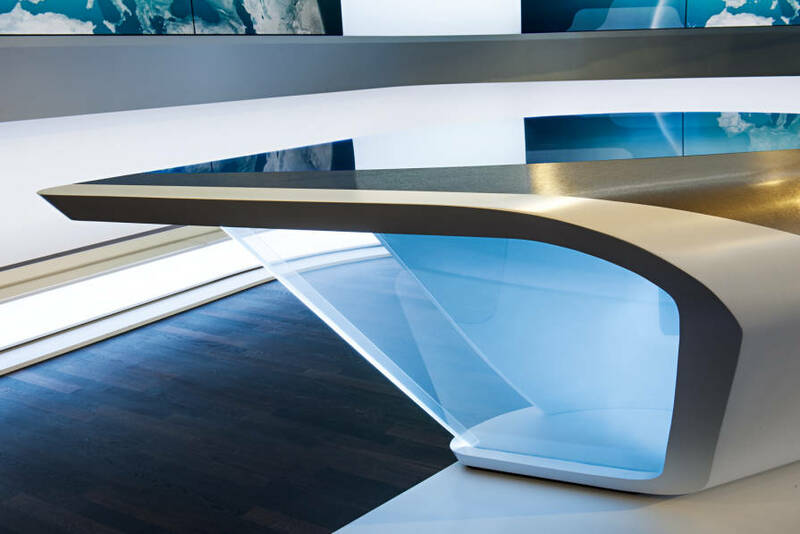 The two identically-shaped presenter desks, connected by a platform and accentuated by lighting, are a visual embodiment of the studio’s dual identity and at the same time structure the space. 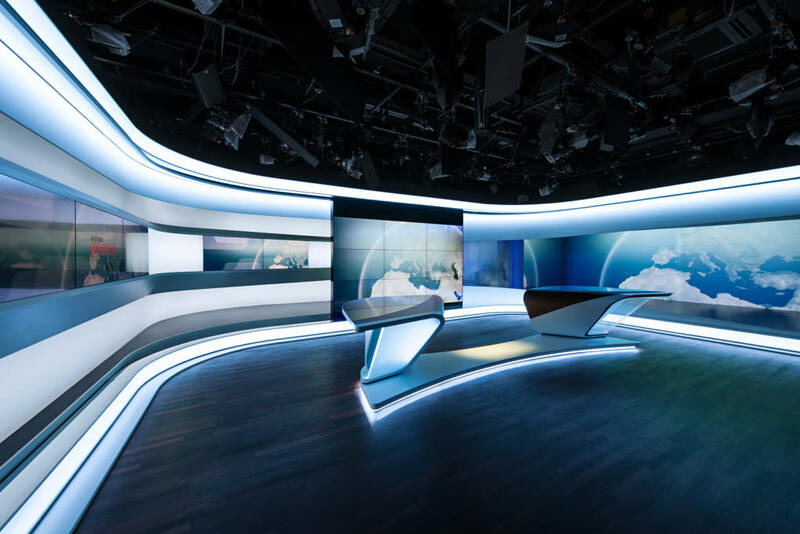 A centrally suspended, moveable, nine-unit video wall, equipped with a motor and a remote control to enable automatic sliding into various positions, enhances smooth on-air transitions between the programs in terms of both camera technology and dramaturgy. 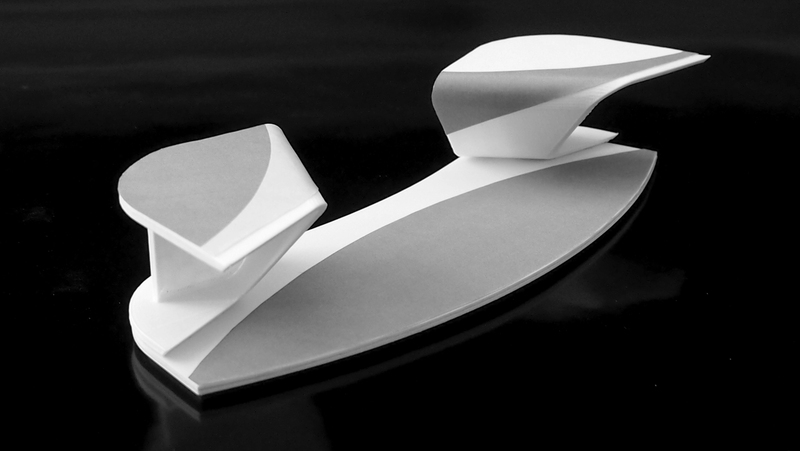 The design is the ideal solution to the challenge of accommodating two different program formats within a single, rather small space. 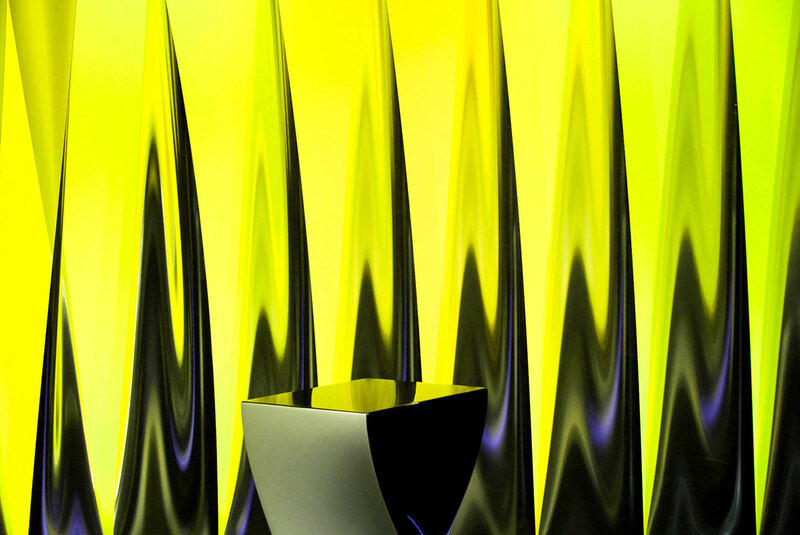 The new studio gives the space a dual identity without dividing it in two. The result is an impression of spaciousness and sophistication, with the added advantage of practical, cost-saving logistics. 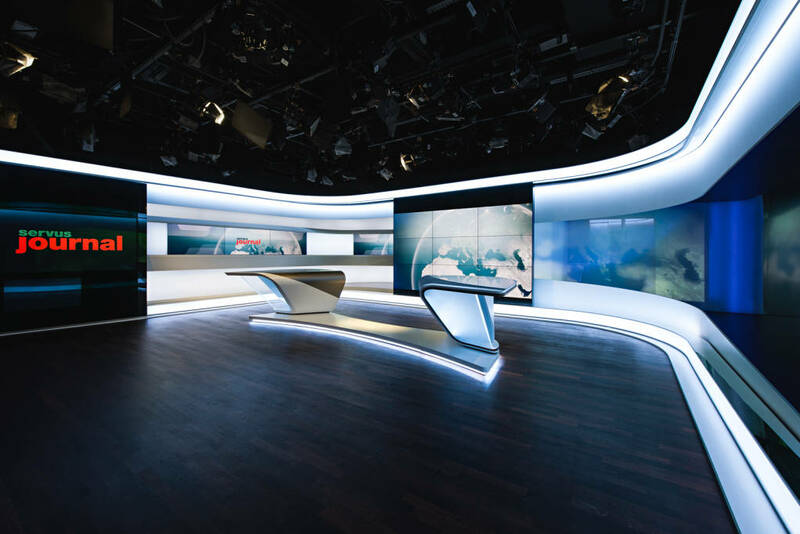 Integrated, dynamic LED lighting enables flexibility in the fine tuning of spatial luminosity and depth perception, accentuating the sharp, clean lines of the newsroom design.